Please find a selection of reviews and testimonials we’ve received for our signs and banner work. If you would like to add your own testimonial, you can do so via our contacts page and we may list your review on our website, thank you. For further examples of our work and customer reviews please visit our Gap Signs Facebook page. In September 2018 we embarked on an ambitious charity event with the target of raising £100,000 for MIND. 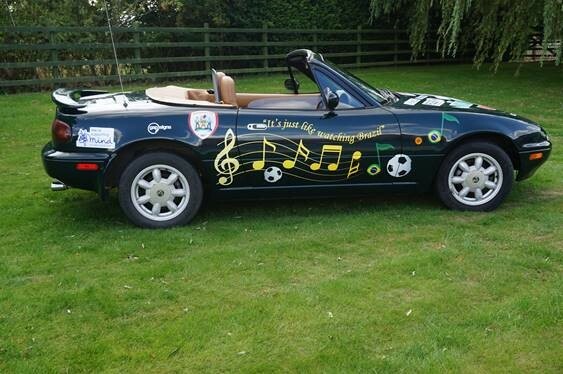 25 vehicles, over 25 years old, costing less than £1.5k each set off on a 2,000 mile journey from Leicester to Lake Como, Italy and back in 5 days. In order to cover up the old battered paintwork on my car I decided to have stickers made, along with the corporate sponsors' logos. I contacted Gap Signs and provided a very loose idea. They worked up a brilliant design in a matter of hours, worked to my timescales and didn't just apply what they had made, but also took all the logos and completed the whole job for me. The result was fantastic and the team at Gap Signs was engaging and professional. Next year (2019) we will be doing this again, different journey and theme, but I will use the same car and Gap Signs again! From start to finish these guys are pros.... 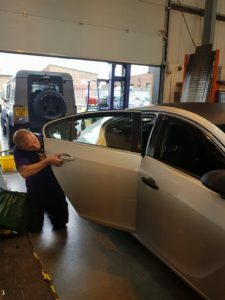 Helpful and professional but also well humoured but most importantly they want to see a good job done more than yourself, reputation is a massive thing to these guys and that's a massive plus to why I went here.....fantastic local business, appreciate what you guys did to my generic car!!!! It's now my car!!! 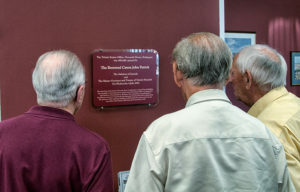 Just to let you know we had our official office opening last week at which your plaque was unveiled. It is just right for the wall it sits on and has been much admired. It was a good choice of material and looks very smart, professional and prominent. We are also very pleased with the TH logo on our external light which is the final piece in our jigsaw with the refurbishment of this old building. My Church, St John's at Scofton, wanted two signs to put up on the roadside on the Retford to Worksop road to advertise our services. I approached Gap Signs who, within a very short space of time, produced an excellent design and quoted a sensible price. We ordered the signs from their extremely helpful staff and they were produced quickly and efficiently. 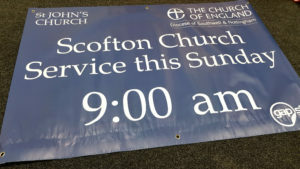 The signs are of a very high quality and withstand the sun and the rain for a week, every month, and are a very effective advert for our Church services. The times of these vary and Gap alter the times on the signs for us, as necessary, in their cheerful friendly way. I recommend Gap Signs to you for their quality, their value for money and their unfailingly friendly, helpful service. Sevenfriday were recently made the Official Timekeeper for Halifax Rugby League Football Club. Since their founding in 2012, the avant-garde indie brand has created a cult following of their watches and Gents Jewellery. 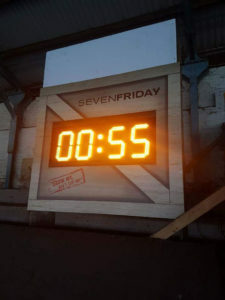 The countdown clock itself was sourced via Berry’s Jewellers, Leeds and the bespoke Clock is surrounded by the packing crate design of the Sevenfriday watches to add a touch of class. The specialist signage was skilfully manufactured to surround the clock and was supplied by Gap Signs of Retford. The clock is a permanent fixture at The Shay stadium, Halifax. Simon Oxby, Operations Director at Halifax RLFC and also Operations Manager at Berry’s Jewellers, was really pleased with the design and the manufacturing of the feature clock and thanked both Sevenfriday and Gap signs for their work together. We offer a comprehensive service from concept to end product installation / High quality craftsmanship using cutting edge techniques and premium quality materials / Bespoke packages to meet individual budgets / Effective customer support with a dedicated point of contact. Innovative thinking combined with technological advancements in sign making enable us to produce a broad spectrum of outstanding signs using the highest quality materials. Our technical expertise and advanced manufacturing techniques enable us to produce effective solutions for promotional advertising and short/long term signage requirements. We believe in professionalism, quality and an exceedingly high level of customer service to meet customer needs and demands at competitive prices to suit every budget. Ava House, 1 Hill Court, Aurillac Way, Retford, Nottinghamshire, DN22 7PX, United Kingdom.